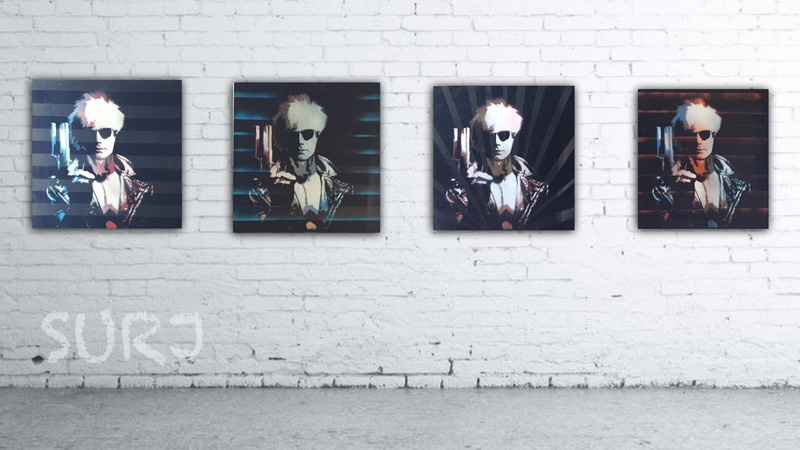 “Warhol has an Army” – The double iconic imagery of Andy Warhol and 80’s Mr. Olympia Arnold Schwarzenegger’s The Terminator! The black back drop lends itself nicely to the black leather look of the jacket, and black shades. . . . Very little paint is actually applied other than the black. . . .Some nice modern/post-modern stripes (Gloss Black Vs. Matte Black) give it a streamlined look. 2 of the pieces have some bounced spray paint to give it a bit more a street look to juxtapose the 2 clean canvasses. 4 different looks of the same image. . . . in the vein of Warhol himself, repeat, repeat, repeat! Probably only see about a million more of these before it’s said and done! Where’s Warhol? He’s everywhere. . . .